The Youth Provincial Assembly Punjab is a new PILDAT initiative which is to be patterned after the Provincial Assembly of the Punjab. Its membership, 40 in total, is to be drawn from across all districts of Punjab. YPAP is expected to provide an opportunity to the target youth to form a network and provide a platform for them to discuss their ideas directly with Punjab’s legislators and policy makers as well as activating them in their communities. The effort is intended to also assist young members in understanding extremism and conflict and understand peace building through mediation, negotiation, and dialogue. The Youth Provincial Assembly Punjab will have its own 2-party system, Deputy Speaker, Leader of the House and Opposition, as well as an augmented system of Committees. As a pilot initiative, the YPAP members are expected to join 3 sessions of 3-days each between October-December 2016. At the end of each session, YPAP would hold a press conference briefing the media about the proceedings of the session. YPAP will have a series of three workshops in each of the three session for its membership on the subject of extremism and its relationship with the Youth. The Youth Provincial Assembly Punjab will have four fixed areas of policy review. The YPAP will be given an opportunity to showcase its work, policy proposals and learning through an interaction with Punjab's legislators, policy makers and media upon the conclusion of the YPAP term. 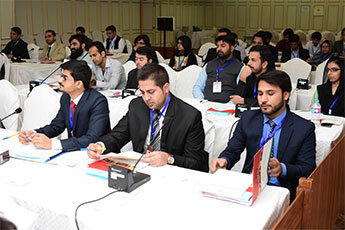 As a model Provincial Assembly for the Youth of Punjab, the Youth Provincial Assembly Punjab is patterned after the Provincial Assembly of Punjab although its membership is smaller than that of the Provincial Assembly of Punjab. Wherever possible, the Youth Provincial Assembly Punjab follows the rules of procedures as close to the Punjab Provincial Assembly as practical. However, better practices from other Assemblies are adopted to expose the Youth of Punjab to better Parliamentary practices. Youth Standing Committee on Information formed within the YPAP will be responsible for ensuring extensive coverage of the YPAP and its daily sessions in print, electronic and social media. Members of the committee would be expected to call on the key newspapers and electronic channels management and invite them to visit the YPAP. The YPAP will have its own website which will carry detailed proceedings and pictures of the assembly. The Youth Standing Committee on Information will issue a press release at the end of each day of meetings. The Chairperson and members of the Information Committee will be responsible for organizing session-wise press conferences and ensure in addition that media shows keen interest in daily proceedings of the YPAP and its policy proposals.